The weather today was just a little cooler and a lot of the smoke seems to be gone but it is still a little hazy. It has been a little cooler and yesterday the air was a lot clearer. Today is another story, as it is very smoky again. We can't see the mountains to the east at all today. 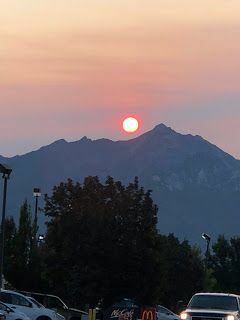 We were out early yesterday and the sun was peaking over the Wasatch Mountains and looked very red. Unfortunately, when I took a picture of it, it looked more like the moon than the red sun it was. After we took this picture and the sun got higher in the sky it turned into a nice clear day.